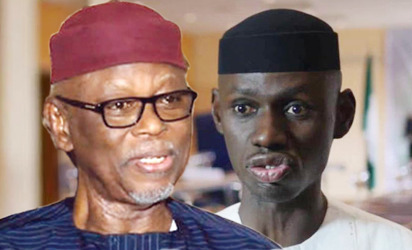 The crisis button in the All Progressives Congress, APC remains unfastened as suspended’ Deputy National Publicity Secretary of the party, Timi Frank, has described, as an admission of guilt, statements credited to the national chairman, John Odigie-Oyegun that there is crisis in its fold. Frank who was reacting to the outcome of Wednesday’s parley between the Senate President, Bukola Saraki and the National Working Committee NWC of the party led by Odigie-Oyegun, said the new rapproachment ‎between the two sides is incapable of staving off calls for the resignation of the chairman. Frank who expressed delight at the chairman’s acceptance that the party is now crisis-ridden, urged him to resign “because the latest romance with Saraki is a campaign after election. Frank in a statement issued Thursday in Abuja said, “it is a shame for Oyegun to go back to his vomit having been used to create some of these confusion earlier which are now beyond his capacity to redeem. “This is a national chairman who did everything possible to ensure that Saraki, who is now a rallying point and Speaker of the House of Representatives, Yakubu Dogara did not emerge their positions when some of us believed in them. “Again, God has vindicated me over most of these crisis I have been talking about that Oyegun refused to admit at that early stage but finally he has agreed but it is too late for him. “It is clear that most of these crisis he is personally responsible for, require a new competent hand to heal the wounds before it is too late for the party. “Instead of inviting Saraki for a romance, why can’t the national chairman call for a National Executive Committee (NEC) meeting where all the leaders will sit at a round table and tell themselves the truth? "I believe that this party urgently needs a new national chairman that will set up a strong reconciliation committee to correct all the abnormalities Oyegun did to APC. "Until this is done, the ongoing re-alignment which I warned my party about might take advantage of the current crisis in APC and weaken it ahead of future elections." Frank, however, called on the Saraki to be careful and watch his back in the latest moves so as not to lose confidence of some Nigerians and party members who believed in him when the likes of Oyegun did not.